Teaming up with FivePoint on the multiple phases of the 688 acre Orange County Great Park (OCGP) construction, has been an exciting collaboration for the ENGEO (geotechnical/water resources/environmental/materials testing) team. This culminated in a huge grand opening event on Saturday August 5th to celebrate the first phase of the Sports Park. 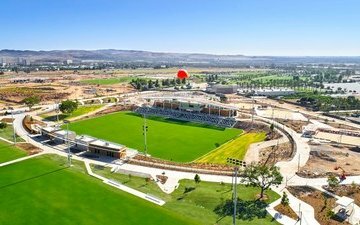 The City of Irvine and developer FivePoint hosted the grand opening of the first phase of the 194-acre OCGP Sports Park, which is the biggest of its kind in Orange County — larger than Disneyland and Disney California Adventure combined. Grand opening festivities included an opening ceremony, a soccer match at the new 2,506-seat Championship Soccer Stadium, the opportunity for the community to take a sneak peek at the world-class amenities and then a free concert by the Blues Brothers with Dan Aykroyd and Jim Belushi in the park.